THE first rugby league game of the season at Miriam Vale's Gary Larson Oval will be under new lights. Gladstone Regional Council has agreed to give last year's residual sport and recreation funding of $21,000 to caretaker group, Gary Larson Oval Enhancement Group, which was on its knees and threatening to shut the gates. Oval leaseholder, Owen Harms, is ecstatic about the decision, handed down in council chambers yesterday. It means Gary Larson Oval will have $44,000 worth of new lights installed by March, allowing the small town to safely host community organisations and sporting groups at the ground. "This will be a huge boost for our senior rugby league team, the Magpies, who rely on playing at night," Mr Harms said. "Now we will have fantastic new lights to play under safely. "We were on the verge of closing the gates and if this hadn't come through that's what we would have been looking to do." 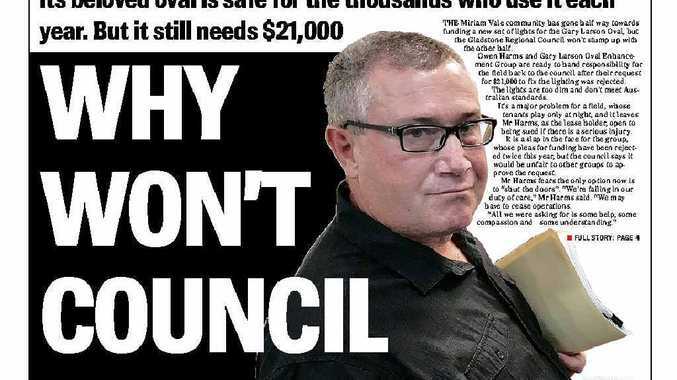 Owen Harms begs council for funding : Owen Harms and the Gary Larson Oval Enhancement Group were denied council funding for the second time this year at this week's general meeting. In November the group, which raised $23,000 towards new lights, made a desperate plea to the council after being rejected twice for funding. This application also fell on deaf ears, the council having said it would be unfair to other groups. In the last round of council sport and recreational funding there were five unsuccessful applications and all were invited to vie for the $20,900. But only the application from the Gary Larson Oval group met the criteria. Central Queensland Motor sports Complex, Benaraby put in an application but asked for $44,000 - more than double what was on offer. Lowmead Social Cricket and Sporting Club also made a bid for $4500 of the left over funding, but their application didn't meet the criteria either.